SUPERAntiSpyware Professional is a user friendly program for Windows that quickly detects all different kinds of spyware, adware, keyloggers, Trojans, malware, hi-jackers, dialers, and worms and allows you to remove them so that you can ensure that your system is as safe as possible. This software uses many different kinds of unique and powerful techniques and technologies to detect and remove the different types of system threats that other applications have had trouble getting rid of. With real time blocking of all the different types of threats that are out there, the ability to schedule scans, and free unlimited customer service via email, you can browse any site you’d like without worrying about whether or not you’re harming your computer in doing so. -Fast and efficient complete and/or custom scanning of your hard and external drives, memory, registry, individual folders, and much more. -Trusting and exclusion of folders available for complete customization. 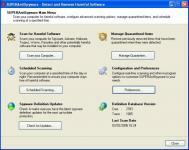 -Detect and remove a wide variety of threats such as malware, adware, spyware, and many more. -Completely detailed scan logs that show you detected and removed threats as well as where they were in your computer. -Real time blocking of all the threats that the internet has to offer.